An Elk Grove Police officers suffered a visible injury to his hand early yesterday morning after being bitten by a Sacramento man. According to police reports, 25-year old Omar Mendoza (pictured above) was loitering at an ATM at the Wells Fargo branch on Bond Road. After being contacted by police officers, Mendoza moved towards officers making furtive movements towards his jacket. When an officer attempted to detain Mendoza, he resisted and began fighting with the officer during which time he bit the officer on the hand resulting in a visible injury. Mendoza continued to resist and would not comply with instructions. When an EGPD K9 officer deployed her K9, Mendoza fought with the dog, the K9 was recalled and another officer deployed his Taser. Not being affected by the Taser, Mendoza continued to resist and the K9 was deployed again and he was subdued with the assistance of five officers. 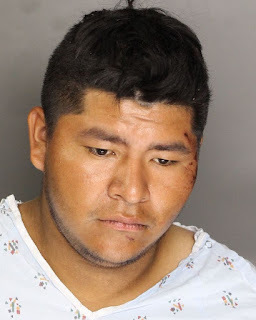 Mendoza was also found to be in possession of a controlled substance and was placed in a Wrap restraint system then transported to a local hospital for treatment. Mendoza is being held on a $60,000 bail at the county jail. Idiot was either on Bath Salts or Angel Dust. Now the taxpayers have to pay to house and feed that idiot.